When the South seceded from the Union, the newly formed Confederate States of America needed its own currency. Lacking the talent of the skilled engravers and printers north of the Mason-Dixon line, the Confederates had to make do with what they had. One of the things they didn’t have were funds to back up their currency, meaning the wide variety of denominations ranging from 50 cents all the way up to $500 had to be accepted on faith that the South would win its independence following the Civil War. When the South was defeated most of these notes were destroyed as they were worthless with no government to back them with hard assets. Fortunately, a few notes have survived and now, 150 years later, you can add one of these important pieces of history to your collection. This $2 paper note not only marks the last of its denomination it also was from the 7th and final series of currency issued by the Confederacy. The note features a portrait of Confederate Secretary of the State Judah Benjamin, one of the most capable members of President Jefferson Davis’ cabinet. During the Civil War, Benjamin also served as the South’s attorney general and secretary of war. When the Confederates lost a battle, he refused to reveal that they didn’t have any available reinforcements, instead accepting a congressional censure. After the war, he spent days burning personal correspondence and government documents before escaping to England, where he became a successful attorney. 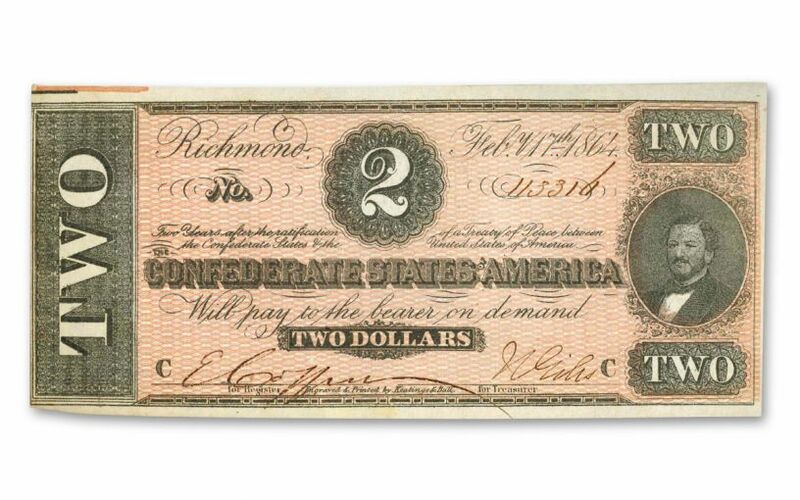 Your 1864 $2 Confederate Paper Note will come in beautiful About Uncirculated (AU) condition. With Civil War artifacts of all kinds always in high demand among collectors, these popular notes are likely to disappear fast. So, limber up your Rebel Yell and secure yours now.